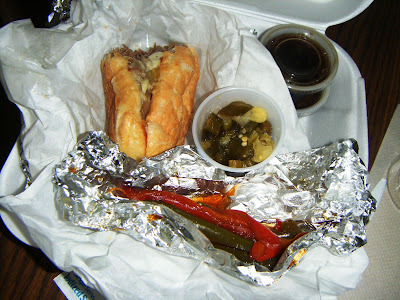 You might notice that half the Italian beef is missing in action. (The sandwich, by the way, was nothing more than a Philly cheesesteak au jus, only nowhere near as good.) That’s because even though she told me she wasn’t hungry, my M.I.L. took one bite, then another, and then she yelped and swore I nearly killed her because I’d studded the sandwich with hot peppers (see: small plastic tub). I’m far more inclined to believe I actually cured her respiratory ailment with that nice little hit of capsicum. The sandwich was edible, but certainly nothing to write home about (you’ll forgive me for doing so anyway). 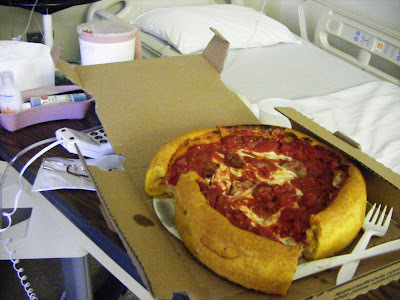 As for the famous deep-dish Chicago pizza. What the heck? It was awful. Really. I couldn’t even eat it. The oddly-textured crust tasted like old cornmeal. My mom-in-law agreed wholeheartedly. Then she told me to wrap up the pizza, and the sandwich that almost killed her and take it back to her apartment so she can reheat it and eat it later. Which, if you’ve read this, should come as no surprise to you. I’d love to report that while in Chicago I had an umpteen-course gastrofest at Alinea. Or slurped a dozen Totten Virginicas at Shaw’s Crab House. Or that I knocked back a margarita and some marvelous Mexican food at Topolobampo. Sorry. No can do. That Chicago-style Vienna Beef dog, dusted with celery salt as is the custom in those parts, was average, at best — though I wolfed it down anyway. 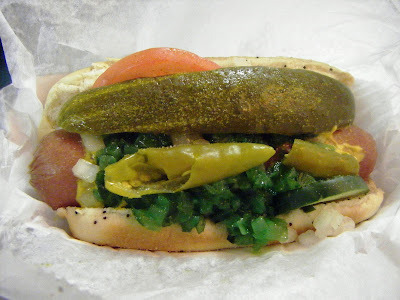 Truth be told, I’d take a Chicago dog from Matt’s Gourmet Hotdogs over that Chi-town “delight” any day of the week. Man, I’m glad to be home.